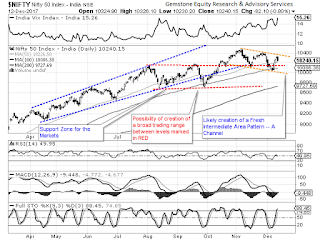 After three days of a pullback, the Indian Equity Markets snapped its rally and saw some corrective pressure coming in. The benchmark Index NIFTY50 ended the day losing 82.10 points or 0.80%. The Markets had seen a technical pullback of 300-odd points from the recent lows but on Tuesday, it gave up a quarter of its recovery. Going into trade on Wednesday, we expect a quiet start to the session. The Index has taken support at its 50-DMA and this level would be important to watch for at Close levels. However, some corrective pressure may remain on the Markets but any breach below 50-DMA will take the Markets lower. Wednesday’s session will see the levels of 10265 and 10300 playing out as immediate resistance levels. Supports come in at 10180 and 10135 levels. Bearish Candle has emerged. However, this formation cannot be read in an isolated manner. It should be read in context of the overall structure of the Charts and its place of occurrence. In the current scenario, its formation remains insignificant. The pattern analysis shows the Markets remaining in the falling intermediate channel on the Daily Charts. 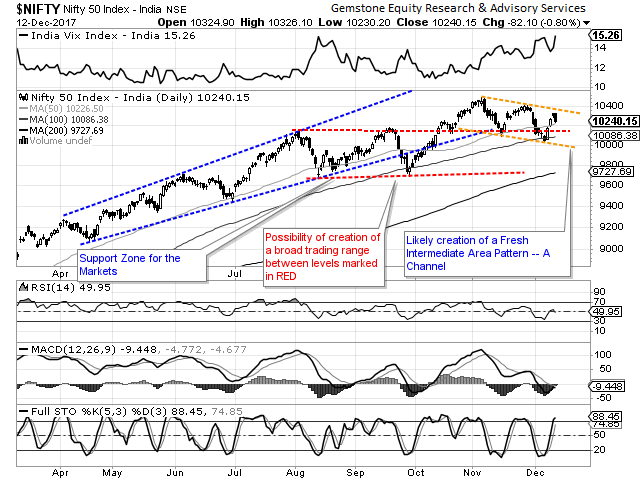 It continues to face resistance in the 10360-10380 levels. Overall, the weakness that we saw in the Tuesday’s session came in little early. Resistance was expected but it was expected in the 10360-10380 zones. These levels will still continue to pose resistance to any pullback that the Markets may see. The Markets are in very close vicinity of the 50-DMA and this would be an important support to watch at the Close levels. Any meaningful breach below 50-DMA might induce some more weakness in the Markets. We advice a cautious view on the Markets, we also recommend keeping overall exposures modest while avoiding shorts.